Singapore (Singapore) – September 21, 2017 (travelindex.com) – Cementing its status as ‘Asia’s Leading Travel Trade Show’, ITB Asia 2017 will celebrate its 10th anniversary with an exciting view to the future of travel and tourism. Under the conference theme “The Future of Travel”, ITB Asia 2017 will showcase an extensive programme of key presentations and discussions by industry heavyweights from the travel and tourism sector. This includes global brand names as well as promising travel startups. To kick off the show, headlining keynote speakers on Day 1 include Tony Menezes, Vice President of Industrial and Distribution Sectors at IBM Asia Pacific, Rob Torres, Managing Director of Advertising and Marketing at Google, and Jane Sun, CEO of Ctrip. Both speakers from IBM and Google will focus on Artificial Intelligence while Ms Sun from Ctrip will speak on its global strategy. With younger generations, including the millennials and Generation X, forecast to embrace cruise travel more than ever before , ITB Asia 2017 will feature its first Cruise panel. The line-up will feature global cruise operators who will discuss the rise of cruise in Asia Pacific and the growing market and opportunities. Moderated by Christina Siaw, Chief Executive Officer, Singapore Cruises Centre, confirmed panelists include companies such as SkySea Cruise Line, Norwegian Cruise Line Holdings Ltd, Princess Cruises, Carnival Asia and Royal Caribbean Cruises Ltd.
Corporate and MICE participants at ITB Asia have grown in the past years. To reflect this strong support, ITB Asia will see its first ever Corporate Day on 26 October, with confirmed partners such as the Global Business Travel Association (GBTA), Egencia, Corporate Travel Management, UOB Travel and Airbnb who will deliver presentations and workshops on the corporate sector at ITB Asia. Following the success and launch in 2016, MICE Day will return for the second edition in 2017 on 25 October. Confirmed partners include American Express, Incentive Conference and Event Society Asia Pacific (ICESAP), International SOS, Meetings Professional International (MPI), The Philippine Association of Convention/Exhibition Organizers and Suppliers, Inc. (PACEOS), Society for Incentive Travel Excellence (SITE), and United Networks of International Corporate Events Organisers (UNICEO). ITB Asia 2017 is expected to top the success of ITB Asia in 2016, where almost 900 buyers attended the show, leading to a 1:1 ratio between exhibitors and buyers whilst over 50% of buyers signed deals with exhibitors after the event. 43% of attending buyers had purchasing power of USD 500K – USD 1m and 85.7% of attending buyers were direct decision makers. 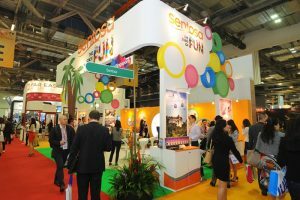 ITB Asia 2017 will take place at the Sands Expo and Convention Centre, Marina Bay Sands, from 25 – 27 October. It is organised by Messe Berlin (Singapore) Pte Ltd and supported by the Singapore Exhibition & Convention Bureau. The event will feature hundreds of exhibiting companies from the Asia-Pacific region, Europe, the Americas, Africa and the Middle East, covering not only the leisure market, but also corporate and MICE travel. Exhibitors from every sector of the industry, including destinations, airlines and airports, hotels and resorts, theme parks and attractions, inbound tour operators, inbound DMCs, cruise lines, spas, venues, other meeting facilities and travel technology companies are all expected to attend.